This post is about this year's costumes I prepared for my girls. I know, it's too late for Purim and too early for Halloween, but I decided to show them now anyway. 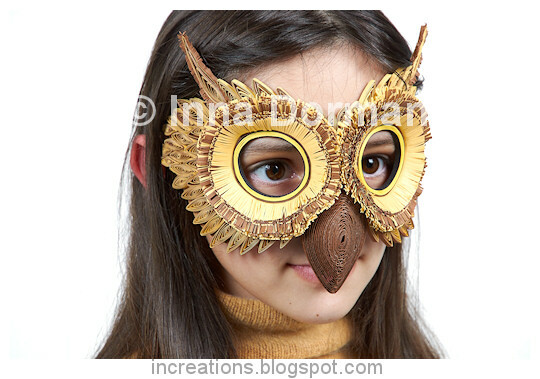 My elder daughter wanted to dress up as an owl, and I thought of the idea of a quilled mask right away. The mask is built on a cardboard base. First, I made the inner rim of the eyes using yellow and black strips 1/8 inches wide (about 3 mm). Then I cut wide brown and beige paper strips and used the fringed flowers technique to create the "feathers" around the eyes. When they were ready, I cut the rest of the brown and beige paper into 1/8"-wide strips (3 mm), used them to roll "eye" shapes, and glued the shapes onto the base, at the sides of the mask. The beak is made of plain and corrugated, 1/4"-wide (6 mm) brown strips. 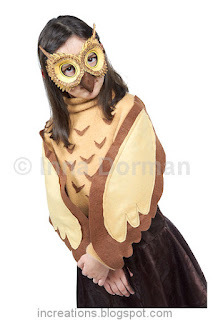 A brown skirt and a sweater with simple wings attached to the arms complete the costume. My youngest daughter wanted to dress up as a little mermaid, and asked me to create a quilled starfish (sea star) hairpin for her. I made the hairpin of purple paper and beads to match the color of the costume, using 1/8"-wide strips for the body and 3/8"-wide strips for the fringe around the rays of the star. 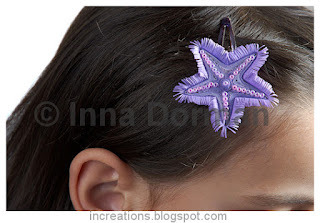 Finally, the sea star was glued onto a plain old hairpin. For the costume I sewed a purple skirt in the shape of a fish's tail, and picked a piece of gauze-like fabric that resembles a fishing net. 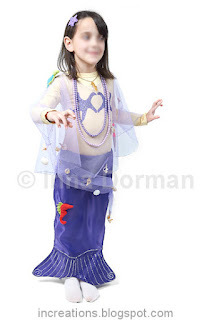 The costume is decorated with sea shells, sea creature finger puppets (cheap seahorse and turtle from IKEA), and a fishing float sewn onto the clothes. You can notice that my little mermaid is wearing also the quilled seahorse pendant I made some time ago. Hello Ina! You works are so beautiful. I like it so much. Здорово! очень красиво и мило!!!! ina beautiful as you always know to bring! Инна, костюмы замечательные! Русалочка с морскими звездами на кофточке это так мило и очаровательно. А маска просто сразила наповал! Несколько раз ее рассматривала, удивительная работа! Wow, that paper owl mask is fantastic. It really looks good - way better than those plastic masks sold for children's costumes! I loved crafting my Halloween costume with my mom each year when I was little. gee, these are so sweet. your girls must be very proud of their mum-made costumes. wow!!! Cute daughters and beautiful work. This is amazing work! Wonderful! Thanks for the detailed description. The owl mask is awesome.. Very cute costumes and cute girls!! Инна, шикарный костюм! Я в восторге! I was so inspired by this handmade mask, that I too tried to make a handmade crown for one of my friend's theme b'day. I just like to thank you for the inspiration. Thank you very much my dear readers!